Description: The Babylonian conquest of Jerusalem in 586 B.C.E. was a watershed event in the history of Judah, the end of the monarchy and the beginning of the exilic period, during which many of the biblical texts were probably written. The conquest left clear archaeological marks on many sites in Judah, including Jerusalem, and the Bible records it as a traumatic event for the population. Less clear is the situation in Judah following the conquest, that is, in the sixth century, a period with archaeological remains the nature and significance of which are disputed. The traditional view is that the land was decimated and the population devastated. In the last two decades, archaeologists arguing that the land was not empty and that the exile had little impact on Judah�s rural sector have challenged this view. This volume examines the archaeological reality of Judah in the sixth century in order to shed new light on the debate. By expanding research into new avenues and examining new data, as well as by applying new methods to older data, the author arrives at fresh insights that support the traditional view of sixth-century Judah as a land whose population, both urban and rural, was devastated and whose recovery took centuries. 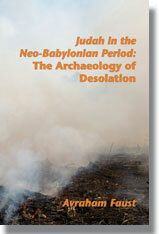 Citation: Ulrich Berges, review of Avraham Faust, Judah in the Neo-Babylonian Period: The Archaeology of Desolation, Review of Biblical Literature [http://www.bookreviews.org] (2013). Citation: Gert T. M. Prinsloo, review of Avraham Faust, Judah in the Neo-Babylonian Period: The Archaeology of Desolation, Review of Biblical Literature [http://www.bookreviews.org] (2014).